A couple of weeks ago I posted a blog about the concept of phantom ring syndrome. Simply put, the phenomena revolves around instances where people feel a vibration or hear a ringing similar to their phone that sends them looking for their cell. We talked through the implications of this phenomenon and concluded that, despite being young, technology has a profound impact on how we think – even to the point of tricking our brain. In my research for that post, I came across a blog written by a young man named Rob who lost his leg to sarcoma and suffers phantom limb syndrome. He reflects in his blog about his inability to rid himself of the pain of the missing limb. That is, until his mom bought him a mirror. Apparently a simple, but very elegant therapy has been devised for lower leg amputees using a mirror. 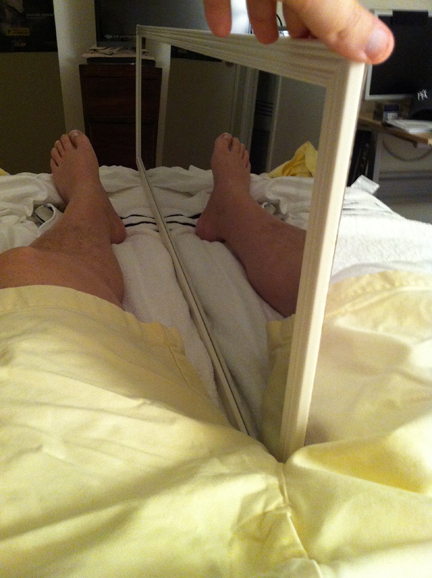 The patient lays the mirror between their legs where it reflects the full length of the unaffected leg. When pain occurs, the patient simply moves their healthy leg in different ways and the brain registers this movement as if it was being done by the amputated leg. In this way, the brain is “tricked” into feeling better, even though nothing has really changed with the amputated leg. Before I go any further, I want to state how grateful I am that someone came up with this solution to those in situations like this. I am thankful that God gave us the creativity to come up with such elegant ways to treat those who are hurting. But, this also got me thinking about how we relate to technology and relationships and how each one effects depth. You see, if we are able to trick the brain (thankfully for the good in this young man’s case) by using a mirror to mimic what is not really there, think about how easy it is to trick our brain with other things that are merely a reflection of what is real? After all if we have 500 friends on Facebook, hundreds of people to text, a webcam on our computer, and simple internet access, we should have everything we need, right? But, we might be falling prey to the mirrors. While the mirrors show us what we want to see, it doesn’t make it real, and it doesn’t bring us any kind of long-term solution to shallow relationships. 1. Spend 1 hour today without your cell phone and engage in real, face to face conversations. Declare a “Social Network Free Afternoon” (horrible title, sorry). Take the hours of 12-6 to engage in real relationships and stay off social networking. Spend 30 min – an hour outside in nature. Connect with what is real. Pray. Think. Re-connect with God and yourself. Let’s not trick our brains anymore.